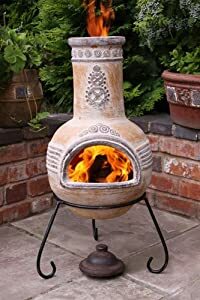 We are now presenting the extremeley popular Azteca Yellow Medium Sized Outdoor Clay Chimenea for a great price. Don't pass it by - purchase the Azteca Yellow Medium Sized Outdoor Clay Chimenea online today! This Clay Chimenea has a beautiful design with a red and green finish that captures the essence of the ancient Maya and Aztec culture. Includes a matching clay lid (see above image).